David Kirk compares two bikes he built. Last edited by Chuckk; 04-15-19 at 07:12 PM. "It's hard for me to process that it's been 30 years since I walked into Serotta for my very first day of work. In many ways it feels like yesterday. Time flies as they say. 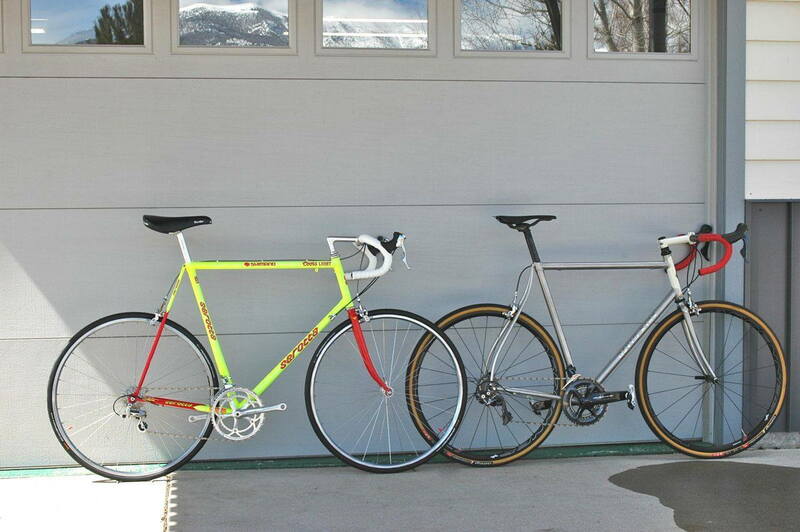 I'm proud of the bikes I built 3 decades ago. They were top shelf at the time and they helped set that standard. It was a big deal to me to play a part in that. That said I'm so much more proud of the rides I make now.....but there's no way I'd be able to build my current bikes without having built all those bikes, all those years ago. I stand on the shoulders of the giants that helped teach me this craft. A huge thanks to them all." Good to know someone is making new steel frames. To me this is compelling evidence in the “how do old bikes compare to new” debate. Two word answer: they don’t, at least when it comes to performance and often comfort. But I’ll still be riding old steel because... well just because. Interesting about the Cin bars/stem being a wet noodle. I’ve never noticed this. Frankly I don’t understand the need to put much stress on the bars at all, even out of the saddle. But it’s possible I’m just a weakling. -Lots of people are still making new steel bikes with 0.9/0.7/0.9 or 0.8/0.5/0.8 tubes. -There were common options thinner than 0.9/0.7/0.9 in 1990. This Serotta was clearly built for stiffness and not feathery weight. -Reynolds 953 is one of the most expensive and thinnest tubesets out there and not very common. So I would say this isn't really a test of "old steel" vs. "new steel" but rather the exceptional heat-treated 17-4 stainless alloy that makes up 953 vs. a standard alloy steel tubeset that was even somewhat overbuilt for the time. The handlebar/brake hood ergonomics I agree with Kirk as being one of the biggest if not the biggest difference in old vs. new road bikes. As to the old cockpit being "flexible as wet cardboard", I suspect there is some placebo effect going on here. Even if the old cockpit is less stiff, it is very difficult for humans to flex thick heat-treated aluminim in a perceptible way. Last edited by TenGrainBread; 04-16-19 at 05:58 AM. It reads a little like a sales brochure for his new offerings. That's what I got out of it. Even the new saddle is way better than the old one? That turbo has stood the test of time. So popular that it is in production today. He wouldn't sell many new Bikes if he found his older ones comparable. Carbon bars and seat post on the newer model dont help with the steel comparison. Yep, I'd love to have a Kirk frame and keep the idea in the back of my mind. But the only time I've ever felt flex in any of my handlebar/stems was with the CF ones on my updated Paramount. Those bars have (or at least feel like it) some give in them when in the drops. I have several bikes built with Cinelli alloy stem and bars and they feel solid to me. What is the bottom line of this? Please summarize. To me this is compelling evidence in the “how do old bikes compare to new” debate. Two word answer: they don’t, at least when it comes to performance and often comfort. He has better wheels/tires on the new one, and better cockpit ergonomics as well. Even the saddle is different. Also quill stems do flex more, it's why French constructeurs made clamp on stems. How much it matters is a different issue. So new bikes, yes, new frames, maybe. Omgar reposted the text and pictures a few posts above so you can read it directly on here. All respect to Mr. Kirk. If I compared his '90's Serotta with a decent '60s bike = it would be lighter, stiffer, with better wheels, faster shifters, etc, etc, etc. Interesting info in his analysis (altho my 70s & 80s stems are far stiffer than wet cardboard) but I still cannot see a purpose to the piece unless it is to remember an old 'friend' he built or help sell his new bikes. If I thought it would make me faster and enrich my bike riding experience, I would buy a 953 stainless steel Kirk frame. Oversized tubes, including steerer and head tube, together with newer stiffer bars and stem feel quite different. I just put 31.8 bars on my modern OS Waterford built Milwaukee and when I pull on the bars to put my limited watts to the pedals, they all go to the tires. He should do a follow up and swap as many components as practical--ride the same tires etc. of course modern bikes are "better". How much difference is in the frame? Interesting read, but I'd guess that the frame and rider size is playing heavily into these impressions. A pretty good read. As a fellow tall person, riding nearly the same frame (or a touch taller), a 130mm Cinelli stem etc is going to be a noodle no matter what. Naturally a 1 1/8" stem and 31.8mm bar are going to feel lightyears stiffere and better. As to the 'cocked wrist angle' on uncomfortable hoods, blame it on the 64 Series bars and anything similar (basically all classic drop bars outside of Cinelli 65 Series/Criteriums and any similar profile). I solved the wrist angle with Cinelli 65s as the bar "gets out of the way" of one's palms due to the bar curving immediately away aft of the brake lever mount. Works/feels the same for 8-speed 6400 STIs on my Land Shark. I'm really glad his modern steel frame includes a steel fork. That's the best 1:1 comparison given all the advancements. A steel frame and a carbon fork is a different issue entirely, and I appreciate him keeping the frame and fork the same material. Right, which is what he’s comparing in the big picture — complete “period correct” bikes. Perhaps he should do another comparison targeting the framesets by putting modern components on the old bike. I think it’s a given that new bikes will generally outperform old bikes at any given level (it’s how technology works) and that we C&V fans can be a bit biased toward the old stuff. That said, I don’t plan on turning in my C&V card anytime soon. I'd love to read a second review where the two bikes used the same components. That would be a true frame comparison. What Dave has done is compare a vintage bike against a modern one, and while fine, there are a lot of mixed variables in play which makes judging the frames difficult. For example, the frame weight difference between the two should be about 1/2 lbs. or so, not 4.4 lbs. as Dave noted between the bikes. Comparing a bike on 30c tires against another on 23c's will drastically cloud any judgement about ride quality too. Just too many variables to separate. Last edited by Nessism; 04-17-19 at 07:50 AM. Another thing to keep in mind is that Dave evidently built the new bike for himself, and definitely built the old one for someone else. Could well be that that customer wanted a relatively substantial bike - not an uncommon thing for pro riders, especially someone of that size. Many racers are notoriously conservative about their equipment and prize reliability above all else. 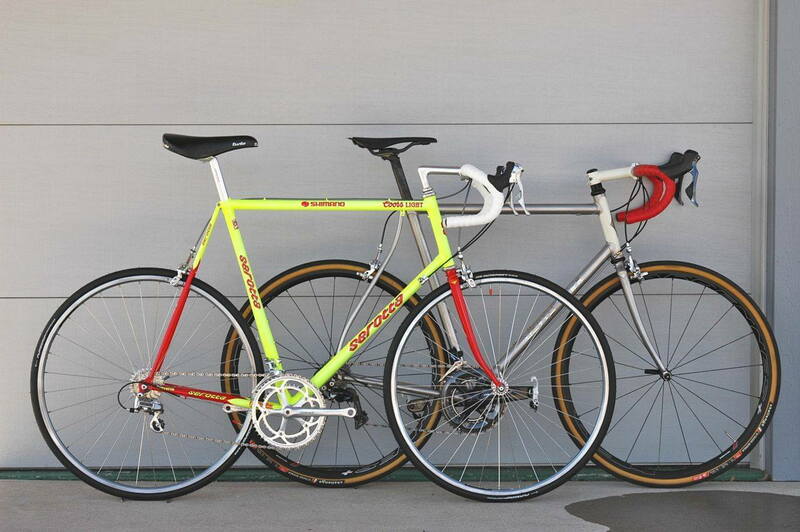 The bars on the Serotta look like Cinelli 64s. I always think the Cinelli 66 with its much larter bend radius would allow the brifters to sit up near the height of the handlbar clamp. That would have eased some of his positional problems.